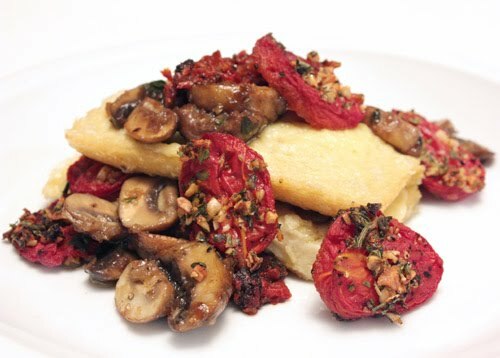 Chickpea flour flatbreads with cheddar, slow-roasted tomatoes, and herby sauteed mushrooms had me thinking about this dish since October. It appeared in that issue of Vegetarian Times, and I have to tell you about my subscription. This is one subscription that I don’t receive in the mail. I subscribe to an online version that arrives in my email inbox. I flip through the pages on-screen, and they look exactly the same as the printed version. I can print pages if I want or go back to the issue at any time. I’m definitely a fan of having physical magazines and books to read, and I don’t think I’ll ever entirely switch to e-reading, but having a subscription here and there in electronic form is a good environmental option. So, when I saw this ‘page,’ it immediately became part of my to-try list. This is very easy to prepare, but you need to plan ahead for roasting the tomatoes. Since fresh, ripe tomatoes aren’t a February crop, I opted for canned, whole tomatoes instead. They worked great. Just cut the tomatoes in half and place them on a baking sheet. Sprinkle them with chopped thyme, rosemary, oregano, and garlic. Then, drizzle them with olive oil and season with salt and pepper, and roast them at 300 F for two hours. Once roasted and full of concentrated flavor, half of the tomatoes were pureed to form a sauce, and the other half were reserved for garnishing. The socca were made by whisking together chickpea flour and salt and pepper, and then lukewarm water and oil were added. That was left to sit while finely diced onion was sauteed with thyme. The mushrooms were added to the onion, and then some dry white wine was splashed into the pan. That was left to cook until the wine evaporated. The socca mixture was poured into a loaf pan, and it was baked for about 10 minutes. Grated cheddar was sprinkled on the socca, and it was returned to the oven just to melt the cheese. The socca wasn’t as firm as I expected, so I may bake it a little longer next time. 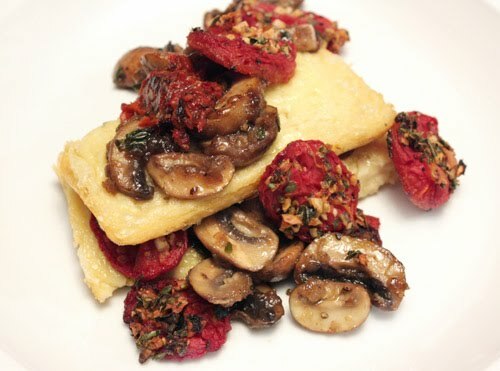 The stacks were formed with a base of tomato sauce topped with sauteed mushrooms, then one piece of socca, and all the layers were repeated with whole roasted tomatoes scattered here and there. This was hearty and rich-tasting, and those tomatoes were bursts of incredible flavor. A little more crispness from the socca would have been nice, but it was still delicious just as it was. Great post Lisa, I have tried to slow cook tomatoes, but I guess fresh ones if you do not have a dehydrated do not have enough liquid to hold them, so you have helped take some mystery out of that for me, and I love the idea of the chickpea recipe. Great! Oh my gosh Lisa, you made socca? I've been wanting to make this specialty forever. Looks really delicious the way you serve it. I've never had socca - it sounds really excellent especially with the yummy mushrooms! Fantastic!!! You can even make these into little appetizers. Oooo....I think you just gave me an idea. Lisa, since tomatoes are not in season in NJ, I buy the plum Roma tomatoes, which are perfect for roasting. I just made a batch. This looks like the perfect recipe to use them for! wow this looks and sounds amazing!It has all my favourite ingredients. I've never roasted canned tomatoes before. I just didn't think they would turn out right. But I'm glad to know I'm wrong since our tomatoes are disgusting just about 365 days a year. This dish sounds absolutely delicious to me. Dana: I stole the idea of roasting canned tomatoes from Molly at Orangette. Good, fresh ones would have been better, but canned worked great! Mmmhhh, socca is so wonderful and together with those mushrooms, it must be heavenly! I did not see this in the magazine...thanks for showing it off! I never heard of socca before, but I'd love to try it, especially if you make it for me :). socca, socca, socca. that's a fun word, and i'd bet my left arm that it's delicious. great tower of food, lisa! That is so interesting that Vegetarian Times looks EXACTLY the same online as in its printed edition. I was just reading this thought-provoking opinion piece in the Wall St. Journal, in which the author took newspaper online sites to task for just being too plain busy looking -- too many widgets, too many icons, etc. I wonder if the general population also would prefer their online news sites to look more like an actual traditional print publication. Food for thought, isn't it? Carolyn: I receive an email with a link when a new issue is available, and the link opens that issue in a reader. As you hit the arrow button in the reader, it flips pages that look exactly like the printed version. In fact, if there's a postcard insert, it flips by those too. I was not aware of online subscriptions, I thought they only did newsletters, summaries of what is in the "real" issue. I like the idea very much, and will look into it. I love roasting tomatoes. It enhances their flavors in an amazing way and this looks gorgeous. I don't particularly like reading e-magazines although I do have a few digital subscriptions as well. For me nothing beats reading a real paper magazine or book! Roasting tomatoes with mushrooms look just gorgeous. Your tomatoes look absolutely divine..as does the whole dish! The chickpea flatbreads so good with tomato topping - yum! I've never even heard of socca bread, but it looks delicious and easy to make. 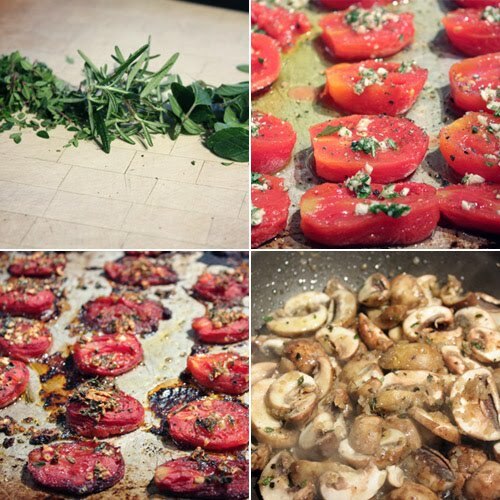 I've been roasting tomatoes for a while- love them with fresh mozzarella and basil- and with herbed mushrooms? Yummy! What a delicious looking treat, and I am having fun trying out different types of flours. Need to grab some chickpea flour if I want to sample this goodie. I tried that with a newspaper and did not like it. I still subscribe to Vegetarian Times and prefer to have the magazine in my hands. I don't know if I will give another try to online subscription some day. That will probably be the future.